Faith building, Christian songs for the young and young-at-heart, with unique sounds and arrangements, performed by an 8 year old boy and his parents. 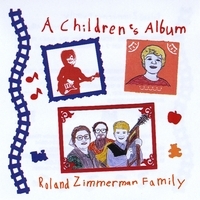 "A Children’s Album” is a CD recording with 14 songs that feature Ryan. Ryan was 7 & 8 years old when this was recorded. This recording has unique, experimental sounds and arrangements. A fun recording! Rather than sticking closely to the bluegrass, country, & folk styles of music, we experimented with different sounds on this recording. We used kitchen utensil & table settings sounds on “Table Grace” The train sounds on “Life’s Railway To Heaven” were recorded at the Red Caboose Motel as the Strasburg Railroad locomotive came by. Roland sawed wood on “The Wise Man & The Foolish Man” for rhythm. Ryan learned the A-Z Bible verses on “Thy Word Have I Hid In My Heart / A-Z Bible Verses” when he was 4 years old. He received a nice Bible from Menno Sell for his memory work after a concert at Landis Homes. He was the youngest person to memorize these verses with the scripture references. Praise the Lord!